It’s the time of year when we find ourselves reflecting and, maybe, considering how to be a “better” person in the coming year. There are many self-help or self-improvement books and gurus to turn to, but I found inspiration in a cat – and a fictional one at that. The cat in question is most frequently referred to as HHC (His Holiness’ Cat), but goes by many names (including one she’d rather everyone forgot). HHC is the creation of David Michie, an Australian-based international seminar presenter and author of a number of books on mindfulness, including “Buddhism for Busy People” and “Hurry Up and Meditate.” HHC is the star of his fictional “The Dalai Lama’s Cat” series. 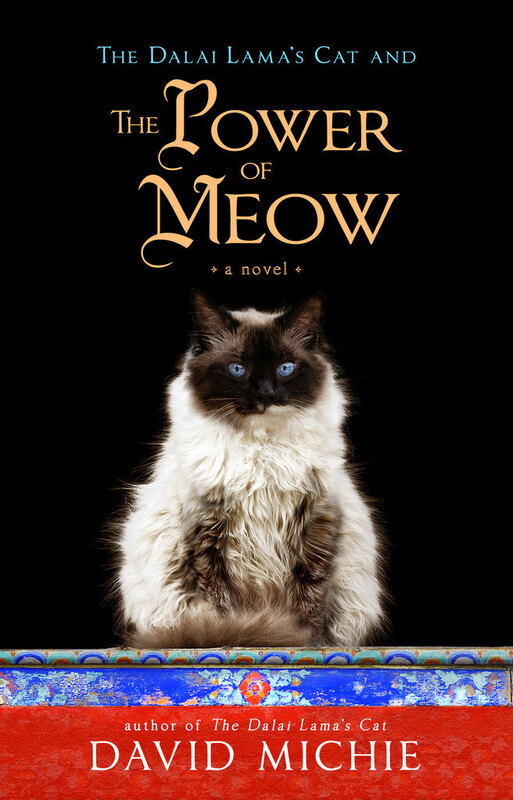 He released the most recent book in the series, “The Power of Meow,” last June (Hay House). Michie’s (pronounced Mickey) series allows him to share his love for cats and the tenets of mindfulness and Buddhism through the lens of an endearing cat and a cast of charming characters. In “The Power of Meow,” HHC is trying to learn how, like so many of us, to live in the moment. I had the pleasure of interviewing David Michie this summer via email because of the time difference between his location and mine. Here’s the edited version of our correspondence. Q. I watched a video on your website in which you said you are crazy about cats. What is it about them that you love? A. My parents bought my older brother a Siamese cat when they brought me home to help cope with any possible jealousy of the new baby. As it turned out, Pandy spent a lot of time in my cot. Consequently, I have always felt it entirely natural to be in the company of a cat – in fact, I don't enjoy not having a feline presence. There are too many things about cats I like to enumerate – but their independence, poise, intelligence, humor and the fact they have two paws in their own world and two in ours, are just some of the things I love about them. Q. In that same video, you explained how you came to write the series as a way to reach those who wouldn't normally pick up a nonfiction book on mind/body/spirit topics. Would you sum up the lessons HHC learns (and we as readers learn with her) in the books? Why did you choose these lessons to write about and why do you think using a cat to share those lessons is appealing to readers? A. Again, there are so many lessons. A few of these are that all sentient beings are the same in certain important respects: we all have consciousness, we all wish for happiness, we all wish to avoid suffering, we all value our life above all else. I think that many people find these messages more palatable in a playful work of fiction than in a didactic work of nonfiction. Q. Would you explain what is the Power of Meow? A. The Power of Meow is the power of mindfulness. Mindfulness offers so many benefits to us physically, emotionally, professionally, in terms of healing, creativity and in so many other ways. Q. Your Dalai Lama's Cat books talk about reincarnation. Do you feel the special cats in your life have been with you in other life times? A. I have no doubt at all that the cats I have shared my life with have also been close to me in previous lifetimes. That is the law of karma. Our job as humans is to ensure that we give our feline friends the very best opportunity to cultivate positive karma and abandon harmfulness to help them in their own spiritual journey. And of course to give them a warm and loving home. Q. You depict real people in the series – the Dalai Lama and a number of unnamed but recognizable celebrities – and you "speak" for them, fictionally. Did you feel any trepidation about doing this? Have you heard from the Dalai Lama or others about the books? Have you met the Dalai Lama? You depict life at the monastery and the town with significant detail – have you spent time in these places or is this all based on research or your imagination? A. I think that the people mentioned in my books would be only too happy by the way they are portrayed. I certainly would be, in their shoes! I have met His Holiness and, like anyone else who has been in his presence, I have no doubt at all that he is an extraordinary, holy being. I have travelled in the Himalayas, but many of the people and places are composite images on which readers can project their own imagined qualities. Q. Do you plan to continue the series and if so, what subjects can we look forward to reading about? A. I certainly would like to continue the series. I guess it all depends on whether or not readers keep showing an interest. I would like to explore compassion in a future book, and how important it is to practice wisdom as well as compassion – a Buddhist theme which is one which many of us have a tendency to overlook. Q. I saw on your website that the cat who inspired HHC died before the publication of the first Dalai Lama's book. Do you have a cat (or cats) now/other pets? A. You can read more about my gorgeous Himalayan cat who inspired “The Dalai Lama's Cat” on my website – The Real Dalai Lama's Cat. Sadly, both Princess Wussik and Mambo have died, but my wife and I plan to offer a home to cats from the local cat haven when we come to the end of our current travels in Europe and Africa. ***Attention nonprofit feline/animal rescue groups: This article can be reprinted for free on your websites or in your print or digital newsletters but you must give me credit, link to my website and send me a link (or a printed copy of) to the reprinted article. To get my mailing address, please contact me.